Delta Masters Swim club meets Sunday mornings 7:30-9:00 with coffee afterwards, and Tuesday and Thursday evenings 8:00- 9:00. All sessions are professionally coached. Masters swimming is fun and great exercise. Delta Masters coaches can help you improve your strokes. Swimming with a group makes swimming enjoyable and helps you stay motivated. I'm not a strong swimmer. Can I join? If you can swim a length of the pool, you can join Delta Masters Swim Club. I used to compete at the national level. Will your club challenge me? I am a runner and want to complete a triathlon. Will your club help me? If there is enough interest, work-outs can be adjusted to offer customized swim training for triathletes. Improve your stroke; improve your time. It is important to let the coach know if you are training for an event; particularly in the spring when triathlon training picks up. Some masters swimmers never compete; some choose to participate in two or three meets each year to focus their training. It's up to you. Swim meets are open to all masters swimmers who enjoy the challenge of competition. Several meets occur in the lower mainland and throughout the province. Swim meet events are planned so that swimmers of similar abilities compete together, and ribbons are awarded in each five-year age group. There is no upper age limit. Club dues are non-refundable. In the event of a medical issue which results in a club member missing practice for no less than two months, with a physicians letter, a partial credit of a members fees will be given. The credit will be 50% of the yearly fee for the number of months of missed practices, less the MSABC fee. The credit will be valid towards the following season only. 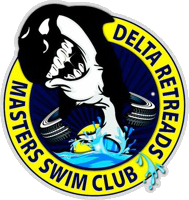 Delta Masters Swim Club is a member of the Masters Swimming Association of British Columbia (MSABC) and Masters Swimming Canada (MSC). Your registration with MSABC and MSC provides you with insurance and entitles you to approximately five newsletters per year from these organizations.